The Typi Folio Case is a multifunctional accessory for iPad 2, doubling as a protective case and a stand. Typi is handcrafted from high-quality leather and felt, providing a slim profile and professional look. IPEVO, a designer and maker of technology products for education and business, has just announced their March "Spring Fling" promotion. While supplies last, customers who purchase IPEVO's Typi Folio Case in black earn a free Icon Power Pack for iPhone and iPod. The promotion is taking place exclusively at IPEVO's online store at http://www.ipevo.com. Following their well-received "I Love Free Gifts" promotion leading up to Valentine's Day, IPEVO is offering another free gift promotion to help usher in the Spring season. The "Spring Fling" promotion does not end on a specified date and instead is in effect only while supplies last. IPEVO has committed 150 Icon Power Packs toward this promotion. To take advantage of "Spring Fling," customers must purchase the Typi Folio Case in black through IPEVO's online store. Only the black-colored Typi case qualifies for the promotion. For each Typi Black a customer purchases, they will receive a complimentary Icon Power Pack at no charge and with free shipping. There is no limit to the amount of Typi Black cases a single customer can purchase, and thus no individual limit for free Icon Power Packs. The Typi Folio Case is a multifunctional accessory for iPad 2, doubling as a protective case and a stand. Typi is handcrafted from high-quality leather and felt, providing a slim profile and professional look. All ports and controls, including the camera lens on the back of iPad 2, are accessible while the iPad 2 is in the case. The strap that closes the case can be rebuttoned to act as a stand, keeping the iPad 2 at one of three viewing angles and providing the user with maximum versatility in terms of watching content and operating. What also sets Typi apart is the full QWERTY keyboard that is attached via magnets inside the case. 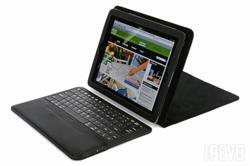 This rechargeable keyboard communicates with iPad 2 via Bluetooth for wireless convenience, and it can be easily removed for remote operation. The keyboard comes with a row of custom hotkeys for common iPad functions, including playback, volume control, search, screenshot capture and more. The Icon Power Pack, manufactured by the Essential TPE company, is a backup battery pack designed for both iPhone (3rd and 4th generations) and iPod. Its name is derived from the battery icon visible on charging iPhones; the pack is shaped like a battery and it has the same translucent green bars to indicate remaining charge. The Icon Power Pack provides a reserve source of battery power, which is especially useful for emergencies and for heavy users. On a full charge, the Power Pack provides approximately 3 hours of additional talk time and 5.5 hours of Internet usage. The pack can be recharged via USB and the included cable. Typi Black is available for a price of $79 with free shipping at http:http://www.ipevo.com. The Icon Power Pack normally retails for $53.68 but is available free through the limited-time "Spring Fling" offer. IPEVO designs and sells innovative products to enrich today's connected lifestyle. We recognize the immense potential of new technologies to help people create, teach, learn, and inspire. From classroom to living room to conference room, IPEVO is dedicated to making technology more available, accessible, and affordable for all. For more information, visit http://www.ipevo.com.